ROBERT P. MUDGE and NICHOLAS R. WALD are with RPM & Associates, Inc., Rapid City, S.Dak. LENS® is a Registered Trademark of Sandia National Laboratories. The focus of this article is to present an overview of the Laser Engineered Net Shaping (LENS®) process, which includes the summary of several successful applications that cover a variety of repairs and freeform projects. Pertinent operating data and technology capabilities and limitations are presented to give a much better understanding of what projects might be considered for this technology. Initial development of the LENS® technology was a team effort between Sandia National Laboratories, Albuquerque, N.Mex., and Pratt & Whitney. Follow-up development work was sponsored by a Cooperative Research and Development Agreement (CRADA). Members of this group included Allied Signal, Inc., Lockheed Martin Corp., Eastman Kodak Co., 3M Co., Hasbro, Inc., Laser Fare, MTS Systems Corp., Teleflex, Inc., Wyman-Gordon Co., Optomec Design Co., Ford Motor Co., Los Alamos National Labs, and NASA. The purpose of this group was to share in the LENS® research and development and to promote the advancement of the technology and speed its commercialization. In 1997, the LENS® technology was licensed to Optomec, Inc., Albuquerque, N.Mex. Since that licensing, Optomec has been the sole manufacturer and distributor of LENS® systems. Presently there are more than 20 systems operating. Most of these are the smaller L750 systems with a 12 × 12 × 12-in. work envelope and are located at universities or large company R&D departments. There are six of the new larger L850R systems in service, which have a 36 × 60 × 36-in. work envelope. The earlier systems were coupled with a 1-kW Nd:Yag laser, while most of the more recent systems are coupled with the new fiber lasers ranging from 1 to 3 kW. Some of the more visible users are Anniston Army Depot with one L750 and one L850R that are being used to repair worn turbine engine components on the M1 tanks. Currently, the only companies that are actively seeking outside contracts are ICE Prototyping & Fabrication, which operates a L750 system coupled with a 1-kW Nd:Yag laser and RPM & Associates, Inc., which operates a L850R system coupled with a 3-kW IPG fiber laser. LENS® may be characterized as a “disruptive additive process” that may be utilized for a variety of repairs and freeform fabrications. Disruptive, not in the negative sense of the word, but disruptive in the fact that this technology challenges one to think outside of the box because of the unique capabilities it possesses. No other additive process combines excellent material properties with near-net-shape, direct-from-CAD, part building and repair quite like this process. Applications include the repair of worn components, performing near-net-shape freeform builds directly form CAD files, and the cladding of materials. Fig. 1 — Basic layout and flow paths for a typical LENS® system. Figure 1 shows the typical process layout. The deposition substrate or “target” is aligned to the desired start point of the deposit. The powder feeder(s) feed the powder delivery nozzle assembly, which creates a powder stream that converges at the point of the deposit. Next, the laser provides a focused beam that is delivered to the point of deposit. The focused laser beam melts the surface of the target and generates a small molten pool of base material. Powder that is being delivered to this same spot is absorbed into the melt pool, thus generating a deposit that may range from 0.005 to 0.040 in. thick and 0.040 to 0.160 in. wide. Motion control for the deposit may be programmed manually or may be generated from CAD files that are processed by the system’s software. Deposits are typically made in a controlled argon atmosphere containing less than 10 ppm oxygen. Some cladding work may be performed utilizing a shielding gas system similar to the gas metal arc welding process. All LENS® deposits are metallurgically bonded and exhibit heat-affected zone (HAZ) and dilution zones ranging from 0.005 to 0.025 in. thick. Low heat input and minimal distortion are consistent deposit characteristics. Due to the small melt pool and high travel speeds, the deposits cool very fast (up to 10,000°C/s), which generates very fine grain structures that may be one order of magnitude smaller in size than comparable wrought products. Mechanical properties and the quality of the deposits are typically better than castings and approach properties of wrought products. In some cases, like titanium, the deposits may actually exceed typical handbook values. Parameters for the low side are laser power of 400–500 W with a 1-mm spot size, deposition rates less than 1 in.3/h and powder utilization rates less than 20%. Parameters for the high side are laser power of 2500–3000 W with a 3–4 mm spot size, deposition rates up to 14 in.3/h, and powder utilization rates up to 80%. Stainless steels (304, 316, 410, 420, 17-4PH), tool steels (H13), nickel alloys (617, 625, 718), cobalt alloys (#6 Stellite, #21 Stellite), titanium alloys (Ti-6-4, Ti-6-2-4-2), and a variety of hardfacing or cladding alloys are some of the materials that are successfully being deposited utilizing this process. Aluminum and copper alloys are very difficult to deposit due to their reflective properties. Research work is also being performed on tantalum, tungsten, rhenium, and molybdenum alloys. Functionally graded deposits are also being investigated. This is where two noncompatible materials, A and B, are joined by gradually changing the deposit chemistry, one layer at a time, from alloy A to alloy B. Flexibility is a key ingredient guiding this technology. LENS® systems are typically coupled with lamp-pumped Nd:Yag lasers or more recently the new fiber lasers. Both lasers have wavelengths that are ~1 micron long. The optical absorption of these laser beams is much higher for the Nd:Yag and fiber laser beams than that of the CO2 laser beam, whose wavelength is 10 microns. Having a higher absorption percentage relates to lower overall energy required to perform a comparable laser deposit. Typically, the Nd:Yag and fiber lasers require only one-half the wattage of a CO2 laser to achieve the same deposition rates. The Nd:Yag and fiber laser beams may also be delivered using fiber optics where the CO2 beam must be delivered via reflective mirrors. This means the component being processed must be manipulated and moved under the stationary CO2 beam. This may still be the case for the Nd:Yag and fiber lasers, but their delivery fibers also have the ability to be manipulated as part of the motion control system. This flexibility opens up many more potential applications. The final considerations for the laser power sources are the floor space required and overall wall plug efficiencies to deliver power to the workpiece. The CO2 laser requires the most floor space and the most energy. The lamp pumped Nd:Yag requires less floor space and less energy, while the fiber laser requires the least floor space and the least energy, but arguably it provides the highest quality laser beam. Supported by South Dakota’s Congressional delegates, a team which included the South Dakota School of Mines & Technology (SDSM&T), AeroMet, Inc., and RPM & Associates, Inc. (RPM), was able to secure FY2002 funding and a contract with the Army Research Laboratory. RPM’s portion of the funds was applied to the purchase of a new Optomec 850R LENS® system, which included an IPG 3-kW fiber laser. This system was delivered in March 2003 and was the first large system manufactured by Optomec. It was also the first system to incorporate an IPG 3-kW fiber laser and the first to use G&M codes instead of the standard DMC codes for the motion controls. These firsts made start up a challenge. RPM and Optomec staffs worked diligently together to transition the laboratory-grade machine into the reliable industrial hardened machine that is operating today at RPM. Many of the hardware and software changes that were made to the original RPM system have been incorporated into the new L850R systems currently manufactured by Optomec. To complement the original system setup, the RPM staff designed and fabricated a laser delivery head system that is very user friendly and capable of delivering the full 3 kW of laser power. When compared to the original delivery head assembly, the RPM head has additional cooling capacity and the ability to easily adjust the focusing lens, which adjusts final delivery spot size. The RPM design is also capable of using a four-nozzle delivery system or a concentric cone (coaxial) delivery system. Converting from the four-nozzle delivery to the coaxial delivery takes only a few minutes. This single upgrade is proving to be the most valuable upgrade to date. The high quality of the deposits is the backbone or strength of this technology. It is the reason this technology is being evaluated by the medical industry, aerospace industry, and Department of Defense, as well as commercial industries that include electric power generation, oil/gas, chemical processing, and mining. The versatility and flexibility of the process is evident in applications where a variety of materials are deposited on several different geometries at a wide range of deposition rates. The realized cost, time, and material savings due to the utilization of this technology is impressive and certainly worthy of additional evaluations. Fig. 2 — Low-wattage Ti-6Al-4V repair and microstructure. If you are operating any type of mechanical equipment with moving parts, repairing or rebuilding worn metal components is part of everyday life. Repairing of worn components typically saves dollars vs. purchasing new parts. Also, when a worn part is rebuilt, the potential exists to repair that component in such a manner that it will have a longer wear life than a new part. These concepts are not new, but the use of the LENS® process to repair components previously considered nonrepairable is new. Fig. 3 — Low-wattage repair of Ti-6Al-4V bearing housing. in this Ti-6Al-4V plate. Multiple layers, each 0.005 in. thick, were applied to achieve the full depth of deposit required for this repair. Note the typical columnar grain growth in the deposit and the very small HAZ in the surrounding base material. Minimal distortion is experienced with this type of repair, which may be used on several aircraft structural components such as wing spars or bulk heads. Several gas turbine engine components as well as land-based turbine blades are potential candidates for this low-wattage repair. Repairs of this type typically involve critical components and require substantial qualifications of the repair process before the process can be implemented. Working through the qualification process is a challenge to say the least, but the potential savings in time, materials, and dollars is so great, it is worth the effort. Another application employing a low-wattage repair is shown in Fig. 3. This is a Ti-6Al-4V bearing housing from a gas turbine engine. The bearing seating area was worn to an out-of-tolerance condition, and the housing was considered scrap. The process was utilized to build up the worn area, which was followed by final machining to print tolerances. This housing was successfully repaired, with no measurable distortion, and has completed an evaluation run in a test engine. The repair costs are about 50% of new pricing plus it saves all of the materials that would be required to manufacture a new housing. Delivery for the repaired housing is a few days compared to several weeks for a new housing. Fig. 4 — Repair of Inconel® 718 compressor seal. 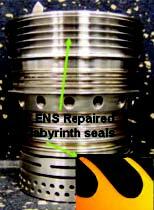 Figure 4 illustrates a very finesse repair of a gas turbine Inconel® 718 compressor seal. When the labyrinth seal diameter wears 0.008 in., the engine loses power and the seal is considered scrap. This test seal was repaired using Inconel® 718 at a cost of about 45% of the new. The repair deposit caused minor shrinkage of two inside diameters, which was identified during the inspection process. These diameters were machined to print tolerances, and the repaired seal was accepted by the customer. Additional seals are currently in the repair cycle and will be evaluated early in 2007. The LENS® deposits are metallurgically bonded to the substrate; not mechanically bonded like spray or chroming processes. The top-half of Fig. 5 shows a high-speed (8800 rpm) 4340 drive shaft that has been repaired using a conventional spray process. Note the severe spalling in the repaired tapered area of the shaft. The user tolerated this recurring problem due to the high cost of a new replacement shaft, and because the chance of a successful repair of the shaft using conventional welding processes was very slim. The LENS® process was tried. Several of these shafts have been successfully repaired over the last two years using 420 stainless steel. The 420 repair is harder (RC 50) and has more corrosion resistance than the original base material or the spray repair materials. The repair charge for this shaft is a one-time cost, which is less than 50% of the cost of a new part. Bearing, seal, and coupler surfaces on shafts typically considered nonrepairable by conventional welding techniques are considered great candidates for buildup and repair utilizing this process. Materials such as 4340, 4130, and PH grade stainless steels have been successfully repaired. High-speed shafts, up to 12,800 rpm, high power, up to 3500 hp, and high precision shafts with tolerances measured in 0.0005 in. have been successfully repaired. Another application was the repair of the bearing and seal surfaces of a large 25,000-lb dragline swing shaft. The 4340 shaft was 18 in. in diameter and 16.5 ft long with a gear on one end and a spline cut on the other end. Approximately 20 lb of deposit was required to repair the shaft. The cost of this repair was a fraction of a new one with a turnaround repair time of four to six weeks. Fig. 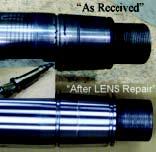 5 — Comparison of thermal spray repaired (top) shaft and LENS® repaired shaft. The process was also used to repair a pressurized air (PA) fan shaft for a coalfired electric power plant. The PA fan impeller failed and damaged the drive shaft, which is typically not an inventoried spare part. With the PA fan out of service, the plant capacity was reduced from 500 MW down to 250 MW. The first choice was, to perform a temporary spray repair to the PA shaft and get the fan back into service as quickly as possible, about one week. Then order a new shaft and once it was delivered, schedule another downtime to replace the spray-repaired shaft with the new shaft. The second choice was to perform a permanent LENS® repair to the damaged shaft and put it back into service as quickly as possible. The second option was selected and the shaft was repaired and delivered back to the plant within 6 days. Full production of the plant was achieved within a similar time frame as the spray repair option, but it was not necessary to purchase a new shaft or to schedule another outage. This repaired shaft has been operating for more than two years and the cost savings realized by employing the process are significant. Fig. 6 — Successfully repaired atomizer drive coupler gear. Figure 6 shows a typical drive coupler from a rotary atomizer used in flue gas desulfurization systems. This gear assembly has two OD surfaces and a thrust face that require rebuilding back to a tolerance of a new part. As shown in the figure, the thrust face is being repaired after the diameter repairs were complete. Upgraded material, 420 stainless steel, was applied to the worn surfaces in an effort to improve the wear life of the rebuilt component as compared to a new component. A similar repair application was the repair of a spindle from a 4-in. Lucas horizontal boring mill. The bearings had seized on the spindle due to lack of lubrication. The standard method of repair would be to premachine the damaged bearing seats, chrome that surface, and grind to final dimension. The LENS® process was used for a permanent metallurgically bonded repair. The repair was successful with no measurable shrinkage on the ID of the spindle assembly. The process may be used to deposit freeforms of near-net-shape metal components that are nearly 100% dense with mechanical properties comparable to wrought materials directly from processed CAD files. Freeforms may be thin wall (minimum 0.060 in. thick) or solid to any thickness. In any event, it is necessary to overbuild or add some “protect” material that is typically machined off to achieve the final desired component. This capability may be employed to make the complete part or to add special features to a simplified casting or forging. To make a complete component, a CAD file of the desired part must be provided. This CAD file is then modified and processed by the system’s software, which generates the tool path for the laser. A target plate is required as a base to start the build. The target plate may be incorporated into the final desired part or may simply be removed when the freeform build is complete. Thermal treatments of the completed freeform builds may be required depending on the specific application. Typically, a portable CMM with a scanning laser system is used to scan the freeform build so the actual build geometry can be compared to the original CAD file. In this manner, any out-of-tolerance areas may be identified and tool path modifications implemented. Special freeform features may be added to simplified fabrications, castings, or forgings. The goal here is to reduce the overall materials required to make the finished part. For example, consider the wall of a forging is 3 in. thick because protruding attachments that are an integral to the final design, which only has a wall thickness of 1.5 in. Then consider if the forging thickness is reduced from 3 to 2 in. and the special attachment features were applied using the LENS® technology, there would be substantial savings in the amount of materials required as well as savings in machining time required to remove 1 in. of excess material. This is a simple example of thinking outside of the box and is a little “disruptive” to existing thought processes. Fig. 7 — Freeforms of 316 stainless steel at various parameters. Freeform builds may be performed using low-wattage/small spot size parameters or high-wattage/large spot size parameters. Figure 7 shows the same 316 stainless steel freeform build deposited at different parameters. The 1-mm spot size deposit took 190 min to build at 0.40 lb/h and 19% powder utilization. The 2-mm spot size deposit took 80 min to build at 0.94 lb/h and 31% powder utilization. The 3-mm spot size deposit took 49 min to build at 1.67 lb/h and 45% powder utilization. The 4-mm spot size deposit took 36 min to build at 2.22 lb/h and 54% powder utilization. Note there is a visual difference in the surface finish of the builds. 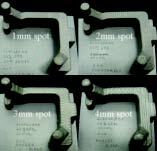 The larger the spot size, the higher the laser power, the shorter the build time, the rougher the surface finish. When building a relatively small part that requires finish machining, these differences may not be important while other larger builds that are not finish machined, the as-deposited surface finish may be very critical. Mechanical properties of these deposits are currently under evaluation. Fig. 8 — Freeforms of Ti-6Al-4V comparing hatch tool path to contour-only tool path. would be structural components for aircraft such as bulk heads or spars. In building the parts shown in Fig. 8, only the desired wall thickness was changed on the CAD file to achieve tool paths for each build. Compare the left-half of the figure that shows the freeform build using a hatching tool path to generate a 0.50-in.-thick wall to the right-half of the figure that shows the same build using a contouronly tool path to generate a 0.30-in.-thick wall. Both builds were performed at 3000 W. The hatch build deposited 9.77 in.3/h at 59% powder utilization. The contouronly build deposited 12.25 in.3/h at 78% powder utilization. The estimated cost for either of these builds is about $2000. The cost of a solid titanium block similar in size was quoted at $3500. The solid block would require more machining than the freeform builds to achieve a final form with 0.200-in.-thick walls. The additional machining chips are just wasted material. Thin wall freeforms are another application for this technology. Figure 9 shows a variety of thin-wall freeforms. Transitions or ducts, creative hollow shapes, and hollow stem engine valves are just a few examples of the wide open potential applications for this capability. Note the conical dual wall build with integral internal connecting ribs shown in the upper-left corner of Fig. 9. The internal ribs are a serpentine pattern. These types of freeforms typically have wall thicknesses around 0.080 in. and may be deposited using many of the stainless steels, cobalt alloys, nickel alloys, or titanium alloys. Fig. 11 — Oil field component clad with wear-resistant tungsten carbide alloys. Cladding is actually a form of repair buildup applied to the manufacturing of new components. The concept of composite manufacturing has been employed for many years. Figure 10 illustrates examples of #6 Stellite® cladding along with typical production parameters for those deposits. Stellite products have been available for many years and have been applied via a variety of conventional processes. 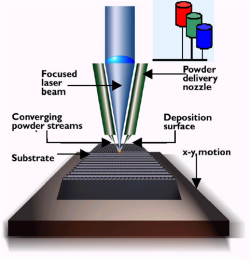 The LENS® process takes the depositing of Stellite to the next level. Very consistent high-quality thin deposits can be made with little dilution. Overbuilding is kept to a minimum, which reduces finishing costs. Hardfacing and cladding using CO2 lasers is highly successful. Combining the LENS® system with the new fiber lasers improves on this success. The fiber laser, with the shorter wavelength laser beam, can achieve equivalent deposition rates with approximately 50% of the wattage required by a CO2 laser. The net result is similar production rates with less heat and less stress conveyed into the part being cladded. The surface finish of the cladding may be left as-deposited or ground to finish dimension. 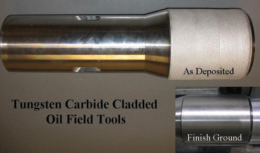 Figure 11 shows an oil field adapter that has been clad with a tungsten carbide alloy. The main photo shows the as-deposited state and the inset shows the final ground product. 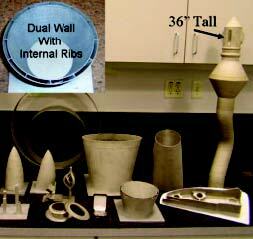 This same concept is also being evaluated as a cladding for boiler tubes in coal-fired power plants. LENS® is a maturing “disruptive additive technology” that provides new capabilities for creative repairs on components that may have previously been considered nonrepairable. Its small HAZ and dilution zones will lead into more cladding and composite manufacturing applications. The process also has the ability to easily change a CAD file for freeform production revisions vs. remanufacturing hard tooling. This is not only cost effective, but will save months of development time on some projects. This freeform ability may revolutionize existing manufacturing processes by employing the concept of simplifying castings and forgings, and then applying special features utilizing this process. We must think outside the box in all of the above-described scenarios. Commercial industries are investigating and successfully employing this technology in a variety of applications. The aerospace industry and the Department of Defense customers are interested in the potential of the technology and are currently working on several developmental projects. However, since this technology is relatively new and there are no published handbook data available, there is much qualification work to be done before total acceptance is achieved in these industries. The next step is to train young engineers to think outside of the box and to fully utilize the capabilities of this unique disruptive additive technology. As this new line of thinking is employed, the LENS® process will be ready to deliver high-quality cost-effective deposits.